Following breakfast Saturday morning I headed back to the exhibit area and spent an hour or so at Powell’s, finishing up my book purchasing. Then I headed for Schneider and Session 376, Contexts of Early Medieval Monasticism I: Architectural Concepts. Before I begin I want to mention that the organizers had put together a booklet which included abstracts of all three Contexts of Early Medieval Monasticism Sessions. Even though I only went to one of these, it provided me with some information which may prove useful once I finish my Early Christianity Reading. First up was Gregor Kalas from the University of Tennessee-Knoxville presenting, “The Residences of Carolingian Abbots and the Afterlife of the Late Antique Villa.” This was a really interesting paper. Kalas opened with a discussion of the Plan of St. Gall showing how the Abbot was expected to live in his own house, not communally. This was supported by the Aachen synod of 817 where Benedict of Aniane amended the Benedictine Rule to have some separation from the community. This separation mimics the villa plan where the owner and his family live in a residence separated from the rest of the estate. Farfa and San Vincenzo al Volturno are examples of monasteries which were formerly villas. The Plan of St. Gall, with its private residence for the Abbot and a private route to the basilica seems to have been modeled after villa construction. Ultimately, Kalas believes that Late Antique villas provided models for monastery plans and that by the 9th century an abbot’s residence could be considered a less luxurious villa. An interesting factoid (to me anyway) was his discussion of Farfa where in the 8th century the abbot lived as something of a recluse but by the 9th century they became increasingly worldly, which he attributes to the evolving relationship with the Carolingian rulers where the monastery became subject to greater royal control and a reduced Papal influence. Good paper and I’m hoping what he talked about is published someplace so I can get a closer look at his evidence. Kirsten Ataoguz of Indiana University-Purdue University-Fort Wayne (IPFW for those of us in Indiana and yes, other than in basketball Purdue and IU collaborate a LOT!) followed with, “Overlapping Contexts of the Last Judgement at the Monastery of Saint John in Müstair, Switzerland.” Now I have a page-and-a-half of notes for this one. Even so, I have a feeling this summary will suffer as much from temporal distance as any because she showed a lot of really cool images which I can’t precisely recall – oh, for an eidetic memory. 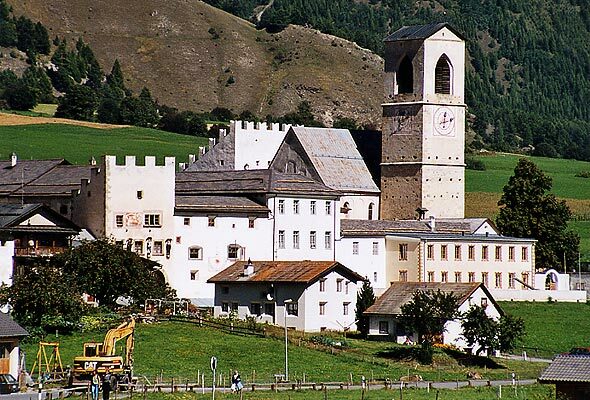 Müstair is one of several 9th century churches in the Alps with a similar image of the Last Judgement. This image tells a story (in looking for images in Müstair, the Last Judgement is just a piece, though an essential one, of the frescoes in the church) showing Christ as judge. He is depicted as the gatekeeper to an apostolic city (a local apostle, Vigilius, is among those shown) and with his right hand up and left hand down shows that he will choose between the saved and damned. These images, prominently displayed in the church, are for the benefit of the laity, not the monks. Ataoguz discussed how this type of story-telling differed from very literal eastern representations. Due to the prevalence of similar images in local 9th century churches she believes it is very possible that this type of representation originated in the region. Another very good paper. Monastery of Saint John in Mustair, Switzerland. Photo from Wikimedia Commons. The final paper was by Annika Rulkens from the University van Amsterdam, “Monastic or Not? The Architecture of Rural Churches in Ninth-Century Hessen.” This was a comparative examination of the architecture of churches to support her thesis that smaller churches should be considered monastic. She believes that smaller satellite churches of Fulda and Sturm, built from the mid-eighth through mid-ninth century were modeled after the larger Abbey churches. These churches were built with the approval of the mother house and while she does not believe they were directed to use similar architecture, they chose to do so. Again, lots of images used for this paper which I don’t recall well enough to describe here. For lunch I had the opportunity to sample the marvelous cuisine in Schneider (said menu choices consisted of pre-wrapped sandwiches – still better than past years and it provided calories) and chatted with The Cranky Professor (TCP) and ADM. Actually, ADM was working for the most part but I had a lot of fun with TCP. I had sort of a theme for the week I went with which was pretty much, “The way I do my job is very different from you,” With an emphasis on the fact that Purdue does not expect me to know how to write – we have a communications department which edits everything we put together. At the time I was in the middle of putting together a fairly short publication which seemed to be taking forever to finish (seriously – I took maybe 12 hours to write the draft, which was 95% of the end product). I’m pretty good at laughing at myself and TCP was willing to join in. I’m in the middle of a 150-page agrosecurity project right now and I dread how long that one will take. I went Goth for the rest of the day, starting with Session 429, Early Medieval Europe II. Louis Shwartz, a Phd candidate from the University of Toronto opened with, “What Rome Owes to the Lombards: Devotion to Saint Michael in Early Medieval Italy and the Riddle of Castel Sant’Angelo.” Michelle Ziegler has already covered this paper nicely and I don’t have much to add. In talking about why Saint Michael came to be associated with Sant’Angelo he discusses mentions of him in Paul the Deacon and believes that ultimately Saint Michael’s association with the church likely dates from Cunibert who was King from 688-700 and Liutprand who succeeded him. Cunibert was a strong promoter of Saint Michael and when Liutprand allied himself with the Papacy and converted the Lombards, this association was solidified. Good paper and be sure to read Michelle’s more detailed summary. Erica Buchberger, a Phd student from the University of Oxford followed with, “Gothic Identity in Spain Before and After the Arab Conquest.” She believes (and I agree with her) that people identifying themselves as Goths disappeared fairly quickly after the Arab Conquests. I regret that I didn’t write down the specific sources she used however she argued that examples of people identifying themselves as Gothic is hard to find after the end of the 7th century. In narratives, Goths disappear as an entity after 754 and afterwards people may say that they were of Gothic descent but they did not identify themselves as Goths. She believes this may have been a sign of loyalty; that they were true to their heritage but loyal to their Arab rulers. However she did say that in the North Gothic identity lasted longer and can be found up to 883 in a chronicle (again, I apologize for not noting which one). The final paper was by Helen Foxhall Forbes of the University of Leicester, “Suicides and the Damned in Anglo-Saxon England.” I recall this being a very interesting paper though it was as much about damnation overall as about the attitude toward suicides. However it is interesting that A-S sources almost never mentioned contemporary suicides but instead focused on those taking place in the past and that suicide is not mentioned in the Anglo-Saxon law codes. Aelfric speaks strongly against suicide and one of the Vercelli Homilies states that “Jews, heathens and suicides” won’t be saved. According to the Old English Penitential and the OE Handbook the body of a suicide cannot be sung over or buried in consecrated ground. In contrast, the Blickling Homily states that a murderer can be saved and there was an Old English belief that even an executed criminal could be saved. Aelfric disapproves of priests fighting and says that one killed in battle will not be prayed for but may be buried in consecrated ground and that he will be judged by God. Good stuff in this one. Following this I headed to Valley II and Session 461, Sixth-Century Italy I: Representing the Ostrogothic Kingdom. I was very pleased to see the sessions on the Ostrogoths this year, in particular that they were organized by Deborah Deliyannis of Indiana University. I decided I was a fan of hers after reading Ravenna in Late Antiquity last year. The first scheduled speaker didn’t arrive so Shane Bjornlie of Claremont McKenna College started things off with “Princeps Illiteraturs: The Political Polemic of the Gothic War and Sources for Theoderic the Great.” This paper discussed how Theoderic was portrayed after his death, primarily during the Gothic War. It was a detailed examination of the sources which, while unsurprising in content, was quite interesting and informative. As might be expected, sources such as Ennodius and Cassiodorus portrayed him as a successful ruler of a Roman province while sources associated with Justinian’s court such as Procopius and Marcellinus Comes depicted him as an illegitimate barbarian. The Anonymous Valesianus describes Theoderic’s death as being the same as Arius’ with his bowels bursting as he was relieving himself. While there wasn’t anything particularly revolutionary here, I enjoyed it because of how many sources were covered, including later ones such as Gregory the Great, Fredegar and Paul the Deacon. Another paper dealing extensively with sources and Theoderic followed as Christine Radtke of The University zu Kõln presented, “Theoderic the Great: Auctor Civilitas, Pius Princeps, Virtuous King.” With the help of a very useful handout she covered the various ways in which Theoderic was portrayed as a legitimate Roman ruler. These included Ennodius’ Panegyricus where he is praised in a fairly standard way as a successor of the Roman Emperors. On the Senigallia Medallion (the only certain image we have of Theoderic) he is titled as Rex and Princeps, titles by which he would have wanted to be known. In Cassiodorus’ Variae, each letter shows a different aspect of Theoderic as ruler and as a whole they stress his civilitas and depict him as someone highly engaged with the past to legitimize his rule and portray him as a Gothic ruler interested in peaceful cooperation between Romans and Goths. I don’t think there was anything new, different or surprising in either of these papers but I appreciated both of them for their examination of the sources. Following this session I headed back to the exhibit area to pick up my book purchases. I’ve gotten better at this over the years and now I rarely leave one behind. It was interesting to find that several publishers are aware of this blog and one person told me that she appreciated my book reviews, particularly when it was one of theirs. Possessing a book from Brill and folks recognizing me all in the same day? That put me in happy camper mode, a good attitude to have when I went to the Pseudo Society Session, had a sub and some beer for dinner (I’d had enough pizza for one week the previous evening) and laughed for a couple of hours. As always, I don’t report on Pseudo, mainly because you have to be there to appreciate it but all of the “papers” were good though I don’t think any make my Hall of Fame. That was enough for me as I skipped the dance, as I do every year, and made it to bed fairly early, only rarely being woken up by the late partying which went on in the courtyard outside my window. Probably didn’t hurt that it was cold enough that said window was closed. Quintus Aurelius Symmachus – Christian Enemy? Based on his writings and what is known of his actions, Symmachus does not appear to consider himself opposed to Christianity, however the more aggressive Christians chose to portray him this way. In fact, as Prefect of Rome Symmachus was partially responsible for the construction of a Christian church, what is today known as the S. Paolo fuori le mure. 7 He was also a friend of Christians such as Ausonius, writes letters of recommendation for Christians and asks his brother to help a Caesarian bishop whose city was unable to pay its taxes after the fisc was seized by a rebel. 8 Even Ambrose never attacks Symmachus personally, just his request, and the two exchange several letters following the Altar of Victory incident, not as friends but as a powerful bishop and powerful senator who respectfully conduct business with one another. A closer examination of Relatione 3 (the one which Ambrose and Prudentius wrote against) shows that his argument is not so much against Christianity as in favor of tradition. 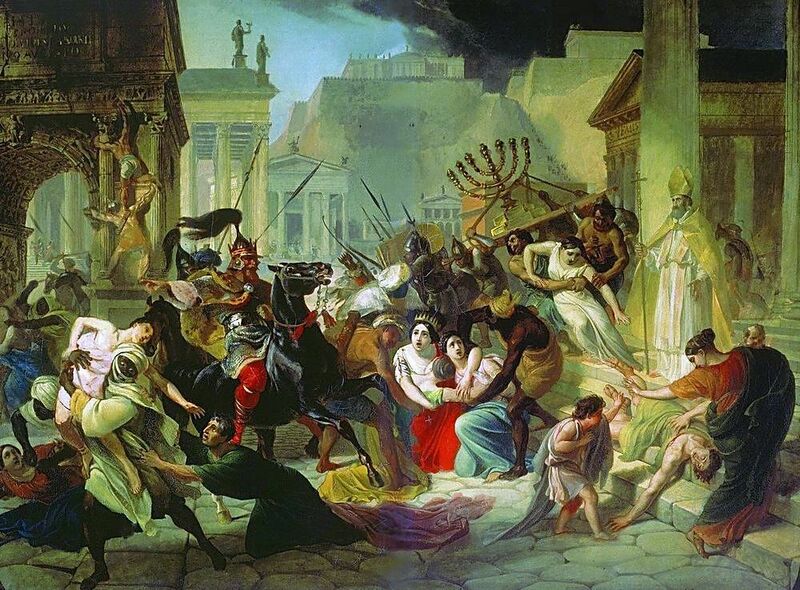 The Gods of Rome have always protected her, how can they be ignored now? Disaster will result if the protectors are spurned. Already a famine has occurred, the likes of which Rome has never seen, where people are reduced to eating twigs and acorns. It is reasonable that whatever each of us worships is really to be considered one and the same. We gaze up at the same stars, the sky covers us all, the same universe encompasses us. What does it matter what practical system we adopt in our search for truth? Not by one avenue only can we arrive at so tremendous a secret. Symmachus does not come across, in this and his other writings, as particularly closed-minded about religion. He seems to believe (or at least he has adjusted to the reality of the new, growing religion) that people should be free to worship as Christians. However he does want the traditional support for state cults to continue. In his writings, this is to safeguard the Empire, and I have no reason to think he didn’t believe this. I’m sure various other factors play into this such as his role as a Priest, the importance of the cults being linked to his importance as an individual, and his sense of self. However he does not seem to be an opponent or enemy of Christianity, or even a rabid supporter of paganism, as he has sometimes been portrayed. From his writings, Symmachus seems more than anything to be a traditionalist. At times, this love for tradition is displayed in unexpected ways. NOTE: I’ve used Barrow(1973) for my references to Symmachus’ relationes however an English translation of Relatione 3, about the Altar of Victory, is also available and for much less money in Liebeschuetz and Hill(2010). 1 Relationes were official dispatches sent by Roman adminstrators to the Emperor. Some of these were simply to keep the Emperor up on what was going on but others were to ask for judicial review or to send greetings from the Senate (The praefectus urbi had a substantial judicial role and was also the titular head of the Senate). In judicial cases, Relationes accompanied the evidence and served to explain the situation more fully. 2 You can find the same language on several online sources (likely some have borrowed from each other) such as Brittannica.com. It is also present at an exhibit at the British Museum. 3 For additional details see McLynn(1994) p 264 and Sogno(2006) pp 50-1. 5 Respectively, CS II, 57, 201, 48, 673 and CS I, 636-8. 6 See Kahlos(2002) pp 95-6 and Sogno(2006) p 52 for an overview of this and Rel 21 in Barrow(1973) for Symmachus’ defense. 8 For Ausonius, see Symmachus’ Letter 1.13. In Letter 1.99 he recommends Ponticianus and in Letter 1.64 he asks for help for Bishop Clemens of Caesaria. 13 Based on references, this seems to be from Symmachus’ Letter 2.36. Kahlos(2002) pp 155-6 and Sogno(2006) pp 56-7. 15 Salzman and Roberts(2011) summarize this very well in their Introduction, pp xxxiv-xxxv. Barrow, Reginald Haynes, ed., Prefect and Emperor: The Relationes of Symmachus, A.D. 384. Oxford: Oxford University Press (1973). ISBN: 978-0-19814-443-4. Heather, Peter and Moncur, David, trans. & ed., Politics, Philosophy, and Empire in the Fourth Century: Select Orations of Themistius. Liverpool: Liverpool University Press (2001). ISBN: 978-0-85323-106-0. Kahlos, Maijastina, Vettius Agorius Praetextatus: A Senatorial Life in Between. Acta Instituti Finlandiae Vol. 26. Rome: Institutum Romanum Finlandiae (2002). ISBN: 952-5323-05-6. Liebeschuetz, J.H.W.G. and Hill, Carole, trans. & ed., Ambrose of Milan: Political Letters and Speeches. Liverpool: Liverpool University Press (2010). ISBN: 978-1-84631-243-4. McLynn, Neil B., Ambrose of Milan: Church and Court in a Christian Capital. Berkeley and Los Angeles: University of California Press (1994). ISBN: 978-0-52008-461-6. Sogno, Cristiana, Q. Aurelius Symmachus: A Political Biography. Ann Arbor, Michigan: The University of Michigan Press (2006). ISBN: 978-0-472-11529-7. Thomson, H.J., trans. & ed., Prudentius: Volume I. Cambridge, MA: Loeb Classical Library (2006). ISBN: 978-0-674-99426-3. Thomson, H.J., trans. & ed., Prudentius: Volume II. Cambridge, MA: Loeb Classical Library (2006). ISBN: 978-0-674-99438-4. Now that I’m removing pain-killers from my diet I find myself wanting to post more (this may end tomorrow when I find out how much I have waiting for me at work) but I’m still having some issues sitting for long periods which is having an impact on my finishing more technical stuff such as my Cameron review. This may actually be a good thing in the long run as I’ve been scribbling notes on a pad while reclining but it’s not doing much for getting the post out. When I’m doing serious work, I perform at my best sitting upright, balanced, focused on my computer, keyboard and whatever references I’ve surrounded myself with. I don’t consider a post such as my recent one on Ambrose to be completely non-formal but it was based on, mostly, one reference and composed more of my impressions than a load of facts. For much of it I was leaning back with my keyboard on my lap. So today I’m going to throw out a few things that I’m looking into and hope I don’t bore everyone to death. As I began looking into my Christianity reading project I decided to begin by reading a bit more on Jerome, Ambrose and Augustine, then work backwards. I’m now thinking this is the wrong approach. The primary impacts of these three are on what came after rather than their output reflecting what came before. My very rough idea of these impacts could be summed up as; Augustine impacting future doctrine; Ambrose impacting Church organization and the role of the bishop and; Jerome impacting asceticism. I am certain that the previous sentence is an extreme oversimplification however I also think there’s some truth at its core. In many ways Jerome may be the most interesting as he was something of a contemporary fringe figure who gained importance as time went on. I’m afraid that once I start reading him I’ll find myself following up with all the stuff I have on asceticism, monasticism, desert fathers, etc. This is fine but it’s not the “start at the beginning of the 5th century and work backwards” method I originally had planned. I’ve read a bit on each of these and have more on my shelves. The question I’m asking myself at the moment is how much of their source material; their writings, letters, sermons, etc., should I read? For Jerome and Ambrose this may not be that big of a deal. There’s a good amount of source material out there but not so much that I can’t go through a fairly high percentage of it. Augustine is another issue. I’ve read his Confessions and City of God. The first seven volumes of the Nicene and Post-Nicene Fathers, First Series consists of his material. This is several thousand pages. How much of this do I need to read? (I don’t expect an answer here) I imagine that On Christian Doctrine, his various works on will and grace, and his stuff against the Donatists will be on my list. What about On the Soul, On Patience, On Virginity, etc.? I’ll figure it out. Hopefully I won’t figure wrongly. Kudos to my friends who are getting smarter (see footnote 1 for details). This year several of my gifts have been cards for booksellers. Yesterday I used a couple of them to order some Symmachus and Libanius. I have two more which I’m going to hold off on using for a bit but at this moment I’m looking at Macrobius’ Saturnalia and Emperor Julian. I have to come up with some pretty distinct thank-you’s so they remember this for next year. Or maybe I just need to schedule major surgery every year around Christmas.